Motivated by curiosity and inspired by intrigue and wanderlust, I set off on a journey to the end of the earth, joining father and son explorers, Robert and Barney Swan and the 2041 team on an eco-educational expedition to Antarctica. Without expectations and an inquisitively open mind, I allowed myself to disconnect from the outside world for two glorious weeks, while taking in everything this magnificent winter wonderland had to offer. It is hard to imagine such a vast, uninhabitable, icy continent being so important to the survival of our planet, and yet there it was in all its frozen glory, the most magnificent place on earth - untouched, unspoiled, pristine and totally breathtaking. Explorers at Damoy Point in the Palmer Archipelago of Antarctica. Iceberg floating in the Antarctic Ocean after having broken off from an ice-shelf. Ice covered land and sea-ice. Antarctica, like the Amazon rainforest, is vital to the health of our planet and to the survival of all species. Known as the world's 'Carbon Sink', the Antarctic Ocean (or Southern Ocean), has the unique ability to actively remove CO2 from the atmosphere and naturally sequester it. When in a balanced state, the Antarctic marine ecosystem is estimated to absorb around 40% of the world's carbon pollution, using nature to take it to the depths of the ocean in a very unique way; with the help of algae. Dust particles containing CO2 are very high in iron, which is like fertilizer to microscopic algae. As carbon and dust particles get absorbed into the ocean, they are consumed by the algae, causing them to multiply. Being single-cell algae they have a short lifespan and when they die, they sink to the ocean floor taking the sequestered carbon with them. 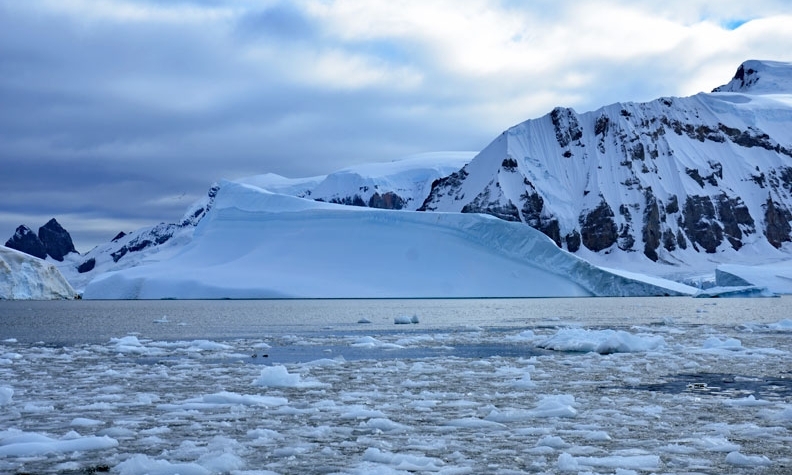 The full importance of the Antarctic Ocean’s ability to sequester carbon is only now being realized, highlighting the vital role it plays in combating climate change. Seals frolicking in Whaler's Bay, Deception Island. However, in order for the Antarctic to sustain this carbon cycle for the long-term, it is imperative that the biodiversity of the region remains in a fully functional, stable, and diverse state. This means protecting all of Antarctica including its wild and marine life from the effects of climate change, over-fishing, and other pollutants. All three are man-made environmental issues and each poses a threat to Antarctica in its own sordid way. Antarctica is surrounded by a very powerful current known as the Southern Ocean Circumpolar Current, which totally isolates the continent, keeping the cold in and insulating the Antarctic sea-ice zone from warmer waters. In turn, the winds within the sea-ice zone keep the ocean intensely cold, thereby allowing the ice to grow during the colder months. However, sea-ice is seasonal, whereas land-based ice-shelves are not. During the winter Antarctica expands as continental-ice and sea-ice become one. Then as summer approaches, the sea-ice begins to melt, breaking away chunks from the attached ice-shelf before floating into the ocean as icebergs. Satellite research shows how in the last several years the Antarctic sea-ice has been declining as warmer waters encroach and average temperatures rise. The Southern Ocean Circumpolar Current is the largest wind-driven current on Earth. It is the only current that goes all the way around our planet and connects the Atlantic, Pacific, and Indian Oceans. Due to Antarctica’s remote location and extreme environment, it has been hard to record the exact effects of climate change on the region. However, the negative impact of the rising temperatures is very evident. Due to Eastern and Western Antarctica being geologically different, the effects of climate change are not uniform across the continent. The Antarctic Peninsula (west) has seen higher than usual temperatures in the last few years, bringing less snowfall and more ice-melts. In the Eastern region, despite higher snowfall, ice-shelves previously thought to be stable are now showing visible effects of our changing climate and are evidently more unstable than reported. A seal on an ice chunk floating off of Detaille Island, a small island off of Graham Land in Antarctica. It is important to note that Antarctica holds 70% of the world’s fresh water and 90% of the world’s ice, earning it the nickname of the World’s Refrigerator. But temperatures are rising. Continental ice that previously remained frozen is starting to melt, which in turn is weakening ice-shelves, causing them to break off into the ocean. Once in the ocean, the ice melts and the sea levels rise. In its natural cycle this occurrence is sustainable, but in the fight of Man vs Environment, we have succeeded in upsetting that balance and now we will also be the ones to pay the price. Sea levels have already started to rise and have proven detrimental to coastal cities and island nations around the world. ‘Climate Refugees’ are now commonplace, with thousands of refugees seeking asylum in foreign lands. After having lost their homes and land to rising sea levels and numerous other climate related events, entire towns are being forced to move to higher ground. As it stands today, Antarctica has certain protections put in place by the Antarctic Treaty, signed by 12 nations* on December 1st, 1959. The Treaty ensures that Antarctica can never be militarized, will only be used for peaceful purposes, and that its legal status will remain unchanged. It also calls for cooperative research between participating nations, as well as maintaining a strict environmental protocol. Currently there are 53 nations participating in the Treaty, of which 28 are active decision-makers. When formulating the Treaty, a provision was included, demanding each nation clean up any debris and waste left during their expeditions, so as to help maintain Antarctica's natural state. Once this was achieved, additional rules were put into place to further protect Antarctica from future encroachment from the outside world. While the Treaty does not recognize territorial sovereignty and prohibits militarization, it does not address industrial fishing, which is having an enormously negative effect on the ecosystem, forcing wildlife to compete for their food supply. Nor does it address the effects of climate change. This is where Greenpeace comes into play. In 2017, the governments responsible for Antarctica’s marine management (CCAMLR), failed to agree on stronger measures aimed at protecting the Antarctic Ocean. This prompted Greenpeace to launch a global campaign calling for an Antarctic sanctuary in the east, covering roughly 695,000 square miles (1.8 million square kilometers), in an effort to protect the marine wildlife and regulate industrial krill fishing in the area. In October 2018, CCAMLR will reconvene and consider the Antarctic Ocean Sanctuary proposal. In the meantime, Greenpeace continue to vigorously campaign for the cause. Our planet works as one ecosystem in sync with everything around it, thus affected by the world around it. It is important to realize that our environmental actions, no matter where we are located, have serious consequences for the entire world. This mysterious ‘7th Continent’ should remain an icy mystery, a sanctuary open only to those working to protect it. It harbors an extreme environment for a reason, and left to its own devices to be at one with nature, Antarctica could just be the continent to save us from ourselves. Kim Michele on Detaille Island, as a part of her epic journey to Antarctica.